River’s girlfriend Nia was killed in a drive-by shooting meant for her brother. In an instant, he loses the only person who has ever meant anything to him, and he is suddenly lost. All he has left of her is the map she left behind, a map detailing every place she wanted the two of them to travel together. River decides to leave his life behind and follow Nia’s map, in hopes that it will keep her memory alive. This was such a powerful story. Breathing Ghosts is told in chapters that alternate between present day and memories that River shared with Nia. Through the memories, the reader begins to understand the type of relationship that River and Nia had and the loss that he is truly suffering without her. Nia was so full of life, even though the life she lead was not the most ideal. She seemed to look on the bright side of things and constantly planned a future for River and herself, anxious to get away from reality. River is very much the opposite of Nia–he is very pessimistic, extremely realistic, and he has no desire to travel and doesn’t understand why Nia plans for something that will never happen. He and Nia come from opposite sides of town and her family does not approve of him. His mother is married to a man who beats her but still protects him over her own son. River doesn’t dare to dream a way out of his situation, yet Nia dreams constantly. When Nia is killed, it seems to finally wake River up. He decides that he needs to get away from the life he is currently living. He takes Nia’s map and decides to follow it just like she had planned. Along the way, he ends up learning so much more about himself. He meets a pair of siblings who end up hitchhiking along on his trip. The three of them end up on a crazy journey across the country, and help each other to move on from their pasts. This story was really beautifully written. I loved the alternating chapters because I still felt like I was able to see River and Nia’s relationship grow and progress even though it was in the past. I really enjoyed reading about all of the interesting places that the map lead to and River’s crazy experiences at each stop. While I didn’t expect the ending, I think it worked really well for the story. Overall, Breathing Ghosts was a beautifully written novel about dealing with grief. The story was really powerful and I really enjoyed reading it. A big thanks to Laekan Zea Kemp for providing me with a copy of the novel for an honest review! 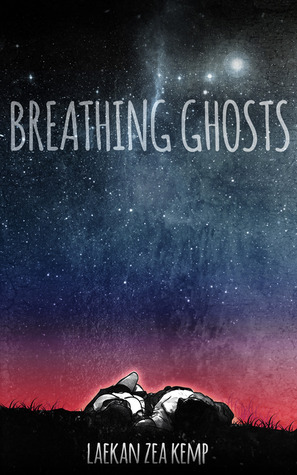 Breathing Ghosts was released on September 30, 2013 (MY BIRTHDAY! ).